16.5 in. Dia. x 27.6 in. H (3.25 lbs.) 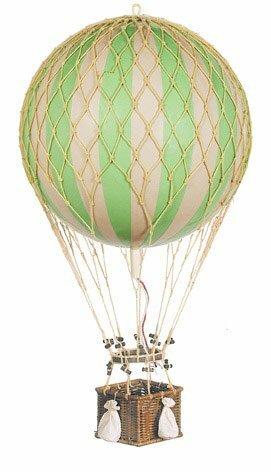 Iconic and inspiring helium filled balloons were one of aviation's first successes. Since 1783, balloons have traveled the skies. The large balloon carries sand bags at the ready for release as ballast. Rattan basket hanging from hand-knotted netting and wood toggles. 16.5 in. Dia. x 27.6 in. H (3.25 lbs.) Iconic and inspiring helium filled balloons were one of aviation's first successes. Since 1783, balloons have traveled the skies. The large balloon carries sand bags at the ready for release as ballast.